Avignon is a city in in the South-East of France. Between 1309 and 1377, during the Avignon Papacy, seven successive popes resided in Avignon. Papal control persisted until 1791 when, during the French Revolution, it became part of France. The town is now the capital of the Vaucluse department and one of the few French cities to have preserved its ramparts. The historic centre, which includes the Palais des Papes, the Cathedral and the Pont d’Avignon became a UNESCO World Heritage Site in 1995. The medieval monuments and the annual Festival d’Avignon have helped to make the town a major centre for tourism. The Palais des Papes is an historical palace located in Avignon. It is one of the largest and most important medieval Gothic buildings in Europe. Once a fortress and palace, the papal residence was the seat of Western Christianity during the 14th century. Six papal conclaves were held in the Palais, from 1334 to 1394. The Pont Saint-Bénézet also known as the Pont d'Avignon, is a famous medieval bridge in the town of Avignon. A wooden bridge spanning the Rhône between Villeneuve-lès-Avignon and Avignon was built between 1177 and 1185. This early bridge was destroyed forty years later during the Albigensian Crusade when Louis VIII of France laid siege to Avignon. Beginning in 1234 the bridge was rebuilt with 22 stone arches. It was abandoned in the mid-17th century as the arches tended to collapse each time the Rhône flooded making it very expensive to maintain. 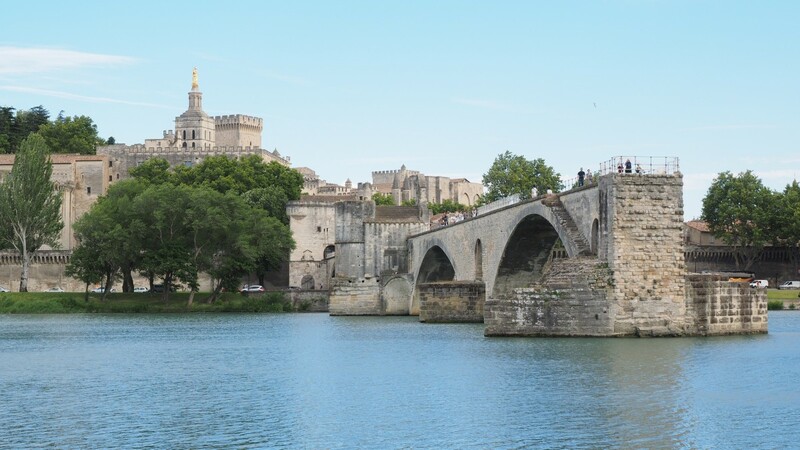 Four arches and the gatehouse at the Avignon end of the bridge have survived. The Chapel of Saint Nicholas sits on the second pier of the bridge. It was constructed in the second half of 12th century but has since been substantially altered. The bridge was the inspiration for the song ``Sur le pont d'Avignon`` and is considered a landmark of the city. The Cathedral was built on the Rocher des Doms and overlooks the Rhone valley. Its construction began in 1150. The Petit Palais Museum is a museum and art gallery in Avignon. It opened in 1976 and has an exceptional collection of Renaissance paintings of the Avignon school as well as from Italy, which reunites many ``primitives`` from the collection of Giampietro Campana. It is housed in a 14th-century building at the north side of the square overlooked by the Palais des Papes. This Museum is located in a private hotel built during the XVIII century.